In 2013, the City of Martensville, Saskatchewan, Canada, the Saskatchewan Board of Education and the Prairie School District selected Sprung Structures to construct a dual-purpose athletic facility that would be used by the city as well as the local high school. Speed and cost were prime factors in determining the best solution. 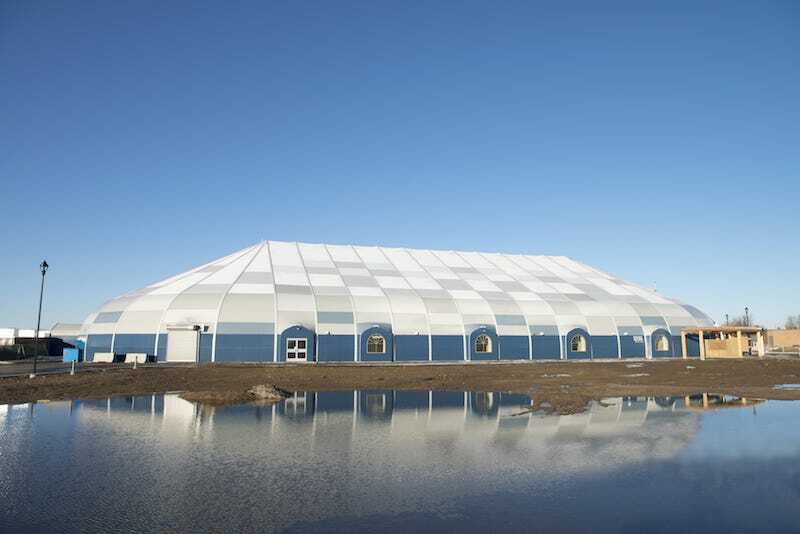 Utilizing Shelter-Rite® Architectural Fabrics as the fabric solution allowed Sprung Structures to construct and enclose the structure quickly so that the interior of the building could be worked on while being protected from the outside elements. The Martensville Athletic Pavilion was completed on time and on budget, opening in 2014. The 50,000-square-foot insulated structure houses three full-size basketball courts, an indoor track, fitness area, multi-purpose offices, concession and more. Multi-colored Tedlar® membranes were used to give an extremely pleasing architectural appearance to the building; much nicer than a building that’s plain white, which at one time was the only exterior color choice of a membrane structure. Combined with attractive glazing walls and graphics, energy-efficient insulation packages make a tension membrane structure a solid long-term choice for sports and recreation applications.